Here are two short legends very similar to the Nine Maidens, both on the lines of youngsters breaking the Sabbath and being turned to stone for their troubles. The Legend of the Dancers. A group of youngsters went up on Stall Moor to have what would have been the equivalent of a modern day rave. Sadly they made the mistake of doing it on a Sunday and God got ‘mightily aggrieved’ with them and sent down his usual bolt of lightning to turn them all to stone. 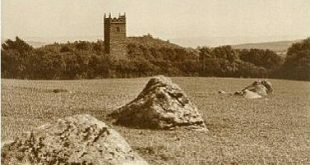 However on this occasion they must have had a little bit of prior warning because some of the assembly ran off after one of their number and these are now represented by the line of stones forming the associated stone row. So the circle are the dancers and the stone row are the ones who attempted to flee. This circle is also known as ‘kiss in the ring’ probably because in another version of the story the youngsters were kissing in the ring which is an old game once played. The Dancers or Kiss in the Ring. 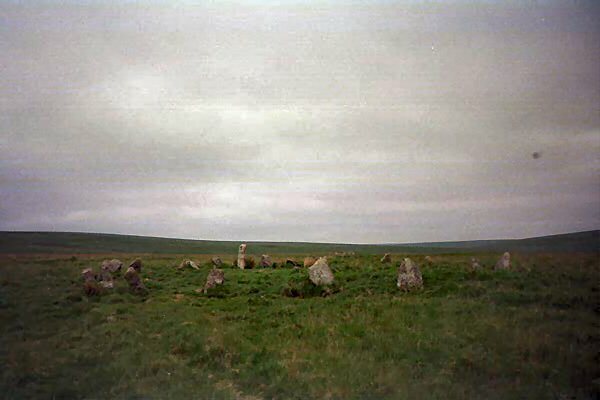 This stone circle probably dates to the Bronze Age and as Butler, 1993, pp 75-7 describes, is sited at the southern end of the longest stone row on Dartmoor. The circle is 51.8 ft (15.8m) in diameter and consists of 22 visible stones, the tallest of which stands at 4.9ft (1.5m). This stone is peculiar to other Dartmoor circles in so much as it does not stand opposite the stone row, this one stands to the NNW. It is thought that these stones are still in their original setting and have not been ‘restored’. The associated single stone row (Staldon Row) leads off northwards from the circle, its total length being 2.06 miles (3320m). Butler, J. 1993 Dartmoor Atlas of Antiquities – Vol. 4, Devon Books, Exeter. The Legend of the Pipers. Again another group of youngsters punished for enjoying themselves on The Lords Day. This time not only did they dance but they had the audacity to play music as well. On this occasion in an effort to hide their sinful activities they went up to Pupers Hill. Once more the heavens opened and a blinding flash turned them all to stone. A visit to the site today will reveal the transgressors stood in their final fateful positions. The nearby reputedly the ‘piper’ and on certain nights the plaintiff wailing of his pipes can be heard on the moorland wind. In this instance the legend is not linked with a prehistoric feature so much as rock piles. Crossing, 1990, p.362 states that the three piles are known from east to west as Inner Pupers, Pupers Rock and Outer Pupers and it is these that are meant to be the petrified youngsters. A short distance away are several guide-stones, the longest of which Crossing names as ‘Kit’s Stone’. Hemery 1976 p.307 notes that it was also known as ‘Little Man’. It is this stone that is reported to be the lone, petrified piper. Both authors agree that the name ‘Pupers’ probably derives from the word ‘pipers’. Hemery, E. 1976 High Dartmoor, Hale, London.